Cast your mind back four years. The great majority of hospital doctors opposed the Health & Social Care Act. So did three quarters of GPs. So did the British Medical Journal, Health Services Journal, and the Nursing Times. So did leading experts in the King’s Fund, the universities, the Royal Colleges and professional associations, the NHS Confederation, the Patients Association, and the health trade unions. But according to a report in today's Times, those at the very top of government are now claiming they didn't notice what the Bill was about, nor the overwhelming opposition from the medical profession. A former number 10 advisor briefed the Times that "No one apart from Lansley had a clue what he was really embarking on, certainly not the prime minister. He kept saying his grand plans had the backing of the medical establishment and we trusted him. In retrospect it was a mistake." And an un-named "Osborne ally" added “George kicks himself for not having spotted it and stopped it." 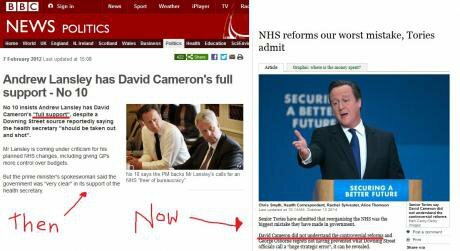 Today's reports contrast with the message from Cameron at the time. In 2012 - just after the Royal College of GPs wrote to Cameron asking him to scrap the Bill, Cameron insisted Lansley had his "full support" and that the reforms "would deliver a better health service for the future" (despite un-named Downing Street sources at the time suggesting Lansley "should be taken out and shot"). But Cameron and Osborne were deaf to the opposition. And the NHS is now on the brink of extinction. I’ve got 35 years’ experience of working in the NHS, from a junior doctor to a GP, and then chair of a Primary Care Trust. I’ve learned that most things can be made to work – even across organisational and local authority boundaries – if you have the right working relationships. Such relationships develop over time through honesty, openness, co-operation and trust. This government’s management of the NHS is a stunning example of how not to do things. Letwin and Lansley’s roadmap is leading to the complete privatisation of the NHS. The first full year of the Health and Social Care Act as a bumper year for multinationals and their lawyers and accountants. A majority of new contracts to provide NHS services went to private companies. Few realise the extent of the rot, as most of these private companies hide behind the NHS logo whilst siphoning off a profit. Collectively, such providers received more than £10bn from the public coffers in 2013. And according to the Financial Times, around £5.8bn of NHS work is currently being advertised to the private sector, a 14% increase on a year earlier. In the past two years, £11bn worth of our NHS has been put up for sale. Things are getting rapidly worse for patients as a result. 35,000 staff have been axed, including 5,600 nurses. Half of our 600 ambulance stations are earmarked for closure. One-third of NHS walk-in centres have been closed and 10% of A&E units have been shut. Waiting lists for operations are at their longest in years as hospitals are consumed by the crisis in A&E. Over one and half million admissions to private hospitals in England each year are funded by the NHS. That is approximately four hundred thousand patients a year, taking money out of the budget-stricken health service and lining the pockets and profits of the private sector. And if things go wrong? From breast implants to eye operations, in addition to paying them to care for patients in the first place, the NHS then has to spend thousands of pounds picking up the pieces when things go wrong. A staggering six thousand patients were admitted to NHS hospitals for complications that occurred while a private patient in 2012-13, an overwhelming number of them transferred as emergencies. This is not only a disgraceful waste of money, it is disgraceful treatment of the sick and injured. Health spending is facing an almost unimaginable cut over the next five years. Every health think tank has done its best in recent months to sound the alarm. This isn’t shroud-waving – the figures show the NHS is at the brink of extinction. The UK is already low on OECD charts in health spending as a proportion of GDP, falling to 15th place - lower than in 2009. A recent report by Washington-based foundation the Commonwealth Fund found that the NHS was the world’s most cost effective, best healthcare system. Of the eleven countries the study looked at, spending in the UK was the third lowest at £2,170 per head compared with £3,200 in Switzerland and an incredible £4,950 in the US. Yet the plan is to plunge lower – just as the number of people over 80 doubles and the population rises by 3.5 million. The Office for Budget Responsibility figures are the same. The Institute for Fiscal Studies calculates age-adjusted spending on health will fall by 9% per person between 2010 and 2018. For an NHS used to an average 4% increase, a 9% per-capita cut is unthinkable. Anita Charlesworth, the chief economist for the Nuffield Trust, estimates the shortfall to be £28bn by 2021. NHS England reckons the sum is £30bn. The morale of the NHS family is at rock bottom. Their pay has been frozen for two years under the coalition, and they have been forced to accept a major downgrading of their pension benefits. Freezing and squeezing pay is heaping financial misery on more than one million NHS workers. Do we really want an NHS that is obsessed with private companies tendering for the work? Or do we want a health service that is passionate about caring for the seriously ill and vulnerable? It doesn't have the ability to do both. The Health and Social Care Act has created a schism that is causing turmoil. An organisation as vast and varied as the NHS will have imperfections, but the ethos that healthcare should be free at the point of use is one that I believe is worth defending. We need to fight for universal healthcare as a basic human right, regardless of whether we live in flourishing suburbs or inner-city deprived areas.